Today we honour the memory of Dr. Adil J. Nazarali. Dr. Nazarali passed away on April 27, 2017. The following was written by Dr. Kishor Wasan, Professor and Dean, College of Pharmacy and Nutrition. 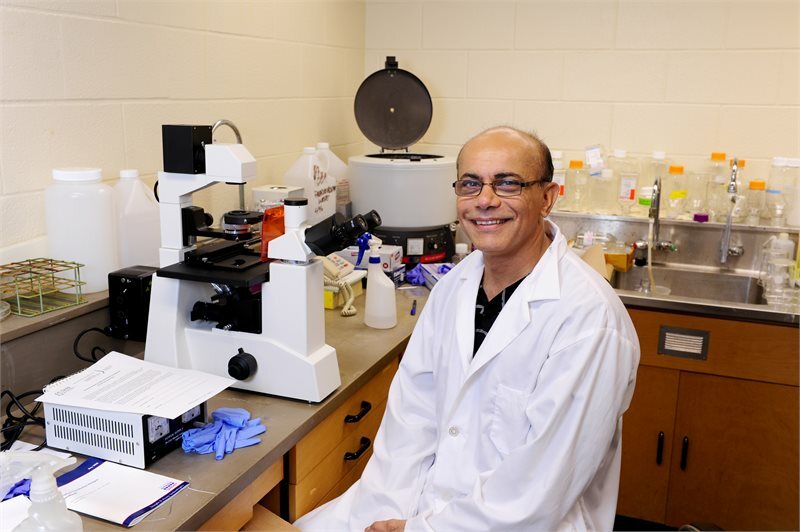 Dr. Adil J. Nazarali, Professor, Laboratory of Molecular Cell Biology, joined the College of Pharmacy and Nutrition in July 1995. He was recently designated as a Fellow of the Royal Pharmaceutical Society of Great Britain, and was only one of three Royal Pharmaceutical Society Fellows in Canada. Adil was very committed to teaching and was awarded the Provost’s College Award for Outstanding Teaching in 2015. He was also a dedicated supervisor, and at the time of his passing he was supervising the following graduate students: Merlin Thangaraj, PhD candidate, Paul Iyyanar, PhD candidate, Kendra Furber, Postdoctoral fellow, Natasha Breward, MSc student, and Glaiza Tan, PhD student. Beginning in 2009, Adil provided opportunities for students from all health science programs for experiential learning in rural Uganda, providing venues for interdisciplinary collaboration outside the classroom and to promote opportunities for personal and professional development. Adil was passionate about research and loved spending time in the lab alongside his graduate students. Adil’s research area was to advance understanding of how the body is able to repair damage to the brain, especially as a function of age. His research focus was on the determinants of myelination in multiple sclerosis, pharmacogenomics of multiple sclerosis, epigenetics and the role of master regulatory Hox genes in development. Adil had a long-term research collaboration with Dr. J. Ronald Doucette (Professor, Anatomy and Cell Biology) and together they published key research articles on transcriptional (Hox gene) regulation of oligodendrogenesis. Adil gained significant expertise in the role of homeobox (Hox) genes in development working with Nobel Laureate, Dr. Marshall Nirenberg, at National Institutes of Health. Prior to this he received his postdoctoral training at the National Institutes of Mental Health in Bethesda, MD with Dr. Juan Saavedra a former colleague of Nobel Laureate, Dr. Julius Axelrod. Adil was the Neuroscience Research Cluster Leader at U of S and principal investigator of the Cameco Multiple Sclerosis and Neuroscience Research Centre with an established research program investigating transcriptional networks and epigenetic mechanisms in cell development and myelinating glia. Adil's passing is not only a huge loss to his family, but also the University of Saskatchewan community.